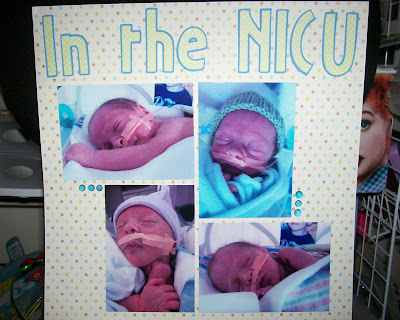 Confessions of a 20-something Scrapbooking Mother: Some NICU pages! 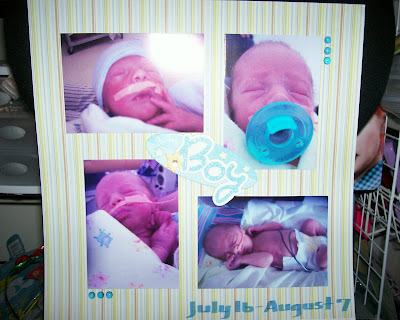 Here is a layout I did from Alex's time in the NICU. I used this ADORABLE Imaginisce line called Baby Powder. I got it at the Great American Scrapbook Convention this summer. Isn't it cute? :) I used my Cricut Opposites Attract cart for the title. You can't see it very well, but the chipboard sticker on the 2nd page is very glittery and says Baby Boy. I got it a few days ago with my awesome 40% off my entire purchase at M's! It was the best shopping trip ever! I also added some dyed skittles so my layout wasn't too plain. With 2 boys photos to scrap, plus trying to catch up on other things, my layouts tend to be pretty simple nowadays. That's all for now. I'm hoping to get some more pages done this week. I was all caught up for a while, now I'm about 3 months behind on Aaron's album, and I only have 4 pages done in Alex's! Thanks for stopping by! Have a great day! I don't think these two pages are plain at all! They're really wonderful! They're so clean, but the photos really take center stage, and that's the way it should be!! What a little sweetheart! I love this! Becky, I love these pages! The paper is adorable! I also love the adorable pics. I love the little dew drops. The pictures are so great that I think the simple layouts work best to show them off.